You can find glass beaded wrap bracelet 'Santiago Atitlan Adventure' by Cristobal Ramirez in jewelry categories such as Glass Bead Bracelets, Nylon Bracelets, Wrap Bracelets and Beaded Bracelets. Enjoy exploring these sections for other Novica treasures. I bought this for my grand daughter for Christmas and love it. It's so different from anything in the stores. I think I'm going to get one for myself! 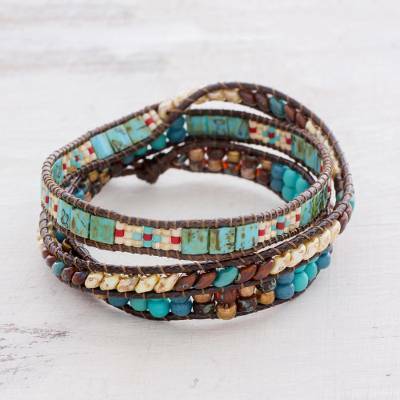 "Precise Detail High Quality Design"
Love the colors of this wrap bracelet which in person is not as wide as the sale image makes it look but the beads are high quality along with the precision stitching. Looks great on and is a good value. Bought this for myself when I go on vacation. It?s beautiful and I will wear it often. The craftsmanship is amazing. I will purchase from them again in the future. I looked at this bracelet many times before I finally ordered it. I have really enjoyed it and have gotten many compliments. The colors look good together and there are enough colors to go with just about anything. I look forward to wearing it more in the spring and summer. It sometimes doesn't show under long sleeves and sweaters. Doesn't keep me from wearing it - I just move my sleeve up every so often. Good purchase.